Nature's Paws 100% pure nettle leaves encourages your pet's natural foraging behaviours with a delicious nutrient boost. Nettle leaves are high in iron and help to prevent urine infections, as well as being delicious to nibble and fun for foraging! This pack contains 80g of pure, natural nettle leaf. Nature's Paws 100% pure Echinacea leaves encourages your pet's natural foraging behaviours with a delicious nutrient boost. Echinacea leaves are naturally high in fibre to aid digestion, as well as being delicious to nibble and fun for foraging! This pack contains 100g of pure, natural Echinacea leaf. Nature's Paws 100% pure ribwort leaves encourages your pet's natural foraging behaviours with a delicious nutrient boost. Ribwort has purifying properties and aids your small pet's digestive health, as well as being delicious to nibble and fun for foraging! This pack contains 120g of pure, natural ribwort leaf. Nature's Paws 100% pure strawberries are a delicious treat for your small pet that are also bursting with antioxidants and Vitamin C. These naturally delicious treats have been freeze-dried for concentrated flavour and nutrition, and long-lasting freshness. Nature's Paws 100% pure cranberries are a delicious treat for your small pet that also helps to prevent urine infections. These naturally delicious treats have been freeze-dried for concentrated flavour and nutrition, and long-lasting freshness. Nature's Paws 100% pure sunflower petals encourages your pet's natural foraging behaviour with a delicious nutrient boost. Sunflower petals help maintain your pet's fur, as well as being delicious to nibble and fun for foraging! This pack contains 30g of pure, natural sunflower. Nature's Paws 100% pure cornflower petals encourages your pet's natural foraging behaviour with a delicious nutrient boost. Cornflower petals are naturally excellent for boosting digestive health and reducing the likelihood of urinary infections, as well as being delicious to nibble and fun for foraging! This pack contains 40g of pure, natural cornflower. The Nature's Paws veggie hide is a delicious, 100% edible home for your small animal. With dandelion leaf, dried carrot, parsnip, parsley root, and beetroot, the hide adds interest and variety to your pet's diet. 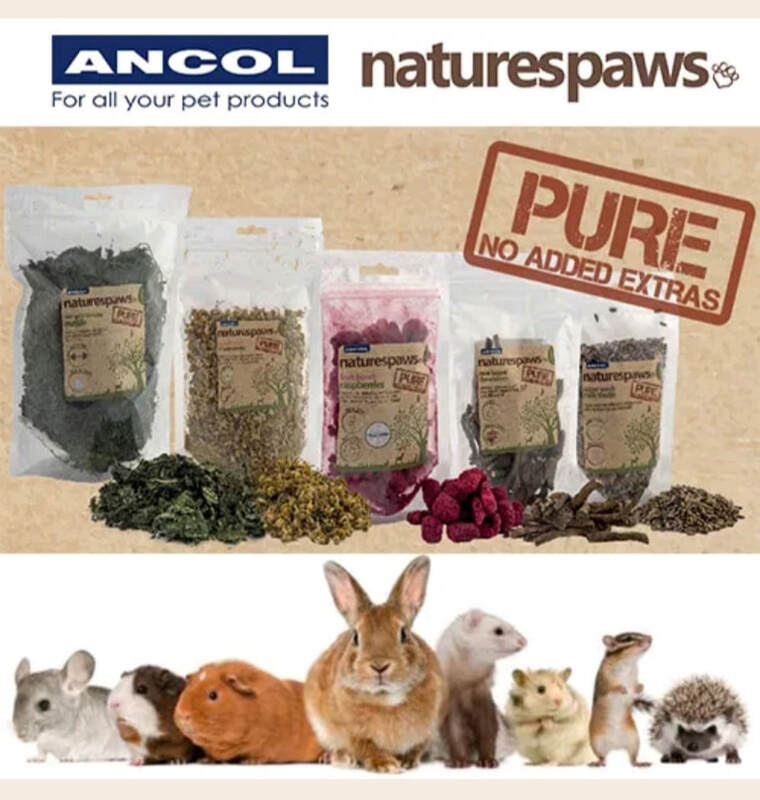 The hide's dandelion leaf is rich in magnesium, whilst the dried root vegetables provide your pet with antioxidants, vitamins, calcium, and potassium for a nutrient boost.